I should say that, certainly in the early years, this fits in with what we know from other sources (the letters especially) on Darwin’s beliefs. Having said all of this, I think the totally negative judgment on Rosenberg’s book is altogether too harsh. Clearly the New Republic contributor has not read Alvin Plantinga’s Where the Conflict Really Lies: Science Religion, and Naturalism, also published in 2011. In fact, the works of Rosenberg and Plantinga share some features, namely a kind of absolutism about their own views and disdain for the views of others. But at least Rosenberg is on the side of the angels in trying to take science seriously — some would say, altogether too seriously — whereas Plantinga takes every opportunity to opt for superstition and ignorance and bad argument. Being an enthusiast for Intelligent Design Theory is the least of his sins. The trouble is that Rosenberg has been seduced into thinking that he can write a popular book, a trade book. Now some academics are very good at this. One thinks at once of Richard Dawkins and Stephen Jay Gould. Others are less gifted, their attempts at trade books veering between the leaden and the louche. I regret to say, because I could use the money, that Michael Ruse’s attempts at this genre fall into the unsuccessful category. 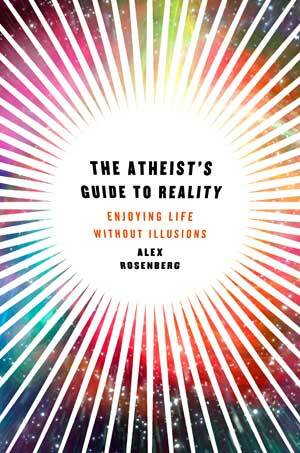 The same can be said of Rosenberg’s The Atheist’s Guide to Reality. A cocky self-satisfaction is simply not a recipe for good writing for the popular domain. The public needs to be spoken to, not spoken down to. All of this seems a preamble to saying that I think the book is not completely without merit. I certainly don’t want to praise it to the heavens, but I would not go the other way either. It is, as the curate said to the bishop when asked about his breakfast egg: “Good in parts.” This seems like faint praise and perhaps it is, but I do want to say that I think parts are good and some parts are very good indeed. Although the material on morality is presented in a way (I think needlessly) intended to shock and disturb — there isn’t any morality and you cannot condemn Hitler and that sort of stuff — in fact Rosenberg brings Darwinian evolutionary biology to bear on morality in a fruitful and enlightening way. He shows that you don’t need the will of God and those sorts of factors to get the proper norms of conduct and that, on the other side, the struggle for existence doesn’t lead straight to the kind of crude Social Darwinism embraced today very regrettably by the Republican Party of the United States of America. Moreover, I am even more glad to say that Rosenberg shows we don’t need any guff about group selection and other faux teleological mechanisms to get decent behavior and thoughts about it. Good, old-fashioned natural selection, working for the benefit of the individual, can do the job. I am pretty sure that most of the solutions offered out there in the literature don’t work. Physicist-theologian Robert J. Russell thinks God puts in direction from down at the unobservable quantum level. This, it seems to me, is simply a tarted-up version of theistic evolution that Darwin himself found so unacceptable in the thinking of his American friend Asa Gray. Non-believer Richard Dawkins thinks that arms races, competition between evolving lines, will eventually lead to beings with massive on-board computers. But even if arms races work, and not everyone thinks that they do, I don’t see that humans will necessarily evolve. Believer Simon Conway Morris (incidentally following non-believer Stephen Jay Gould) thinks that ecological niches exist objectively, that there is such a niche for culture, and that even if we had not found our way into it, some organism at some point would have done so. But apart from anything else, there is good reason to think that organisms create niches as much as they find them. So I am not sure that that solution works either. I myself am inclined to think that multiverses might do the trick. Given enough attempts, like the monkeys and Shakespeare, humans would come into being eventually. But I am not here pushing my own view — for which, incidentally, among believers and non-believers I have found absolutely no takers. I am simply congratulating Rosenberg for taking a lot more seriously a problem that too many think they can easily gloss over. So, why then am I not more positively charged up about Rosenberg’s book? It is perhaps not surprising, as one who thinks of himself as much a historian of science as a philosophy of science, that my complaint starts with history. In this book, Rosenberg expresses contempt for history to a degree that (outside the American automobile business, and look at the state of that) I don’t think I have ever encountered elsewhere. (This is not something new. I remember Rosenberg saying something similar about thirty years ago.) “History is helpless to teach us much about the present.” Continuing: “When it comes to understanding the future, history is bunk.” I won’t comment on the irony of this coming from an ardent evolutionist, but simply suggest that his attitude leads him badly astray. Even as he opens by suggesting that science leads to non-belief, using the atheistic members of the US National Academy of Sciences as evidence, we can see that there is something wrong. Without knowing their histories, how can we be sure that science led to non-belief rather than non-believers turning to scientific inquiry early and fiercely and succeeded? What one can say is that the autobiographies of nineteenth-century non-believers almost always stress that they came to non-belief on theological and philosophical grounds and then embraced things like evolution. In Darwin’s own case, his non-belief came primarily from his detestation of the idea that non-believers like his father and brother were, purely on the grounds of their non-belief, destined to eternal damnation. But let me dig a bit more. Rosenberg thinks that science basically wipes out the claims of religion, either showing them false or explicable purely in scientific terms. He proudly proclaims himself committed to “scientism”: “the conviction that the methods of science are the only reliable ways to secure knowledge of anything; that science’s description of the world is correct in its fundamentals; and that when “complete,” what science tells us will not be surprisingly different from what it tells us today.” In large part I agree with Rosenberg. Obviously you cannot hold to Noah’s Flood and at the same time to modern paleontology, let alone to plate tectonics. As obviously, a literal Adam and Eve are entirely negated by modern paleoanthropology. They did not and could not have existed. I am not that keen on burning bushes or partings of water either. I hope also that my agreement with Rosenberg about morality shows that I think that we don’t need a lot of God talk to get ethical thinking and behavior. And that Darwinian evolutionary biology shows that the call for foundations is mistaken and unnecessary. What about some of the basic issues for theism, for instance the very existence of anything at all (what Heidegger calls the fundamental problem of metaphysics) or at the other end of the scale the meaning of existence? Like other theists, the Christian has answers to these and related questions. Existence itself (that is, the universe and everything within, including us humans) is the product of a good creative God. Meaning is also related to God, and for humans in particular life here on earth is in some sense a time or trial or testing, preparing the way for the possibility of eternal bliss with the Creator, whatever that might mean. As it happens, I am no more accepting of these answers than is Rosenberg. I would describe myself as an agnostic or skeptic rather than an atheist, but essentially I am pretty atheistic about the Christian answers. If there is more to life than meets the eye, as it were, I very much doubt it is something within my present comprehension. The question however is whether science as such negates these answers that the theist would give, and perhaps even more fundamentally whether science makes the very asking of these questions in some sense otiose or inappropriate. This I think is Rosenberg’s position and here I part company with him. In line with Charles Darwin, I reject theism on theism’s grounds rather than because of science. As I see it, Rosenberg simply says that modern science has no place for these sorts of questions, or if it does it answers them adequately — along the lines that the Big Bang speaks to origins — and that is that. In the old days, before the Scientific Revolution four hundred years ago, the Aristotelian science of the day may well have allowed such questions, but now we have moved on from an incorrect science to a more correct science, end of story. And it is here that I would say that the refusal to look at history leads to misunderstandings. If we look at the Scientific Revolution and ask exactly what it meant, we find it was not so much a simple matter of moving from falsity to truth — although I do accept that the new science has many virtues that the old science did not have — but rather a change of metaphors. The old science saw the world in an organic mode — things were living in a sense — and that is why, for instance, it was appropriate to ask about final causes and meanings. The new science sees the world in a machine mode — the mechanistic philosophy — and that, among other things, is why it is inappropriate to ask about final causes and meanings and so forth. Notice however what using metaphors entails. As Thomas Kuhn taught us — and remember how he identified his paradigms with metaphors in some wise — metaphors are powerful tools for focusing on nature and giving us ways of understanding it. But they come at a cost, namely that they are limited and do not (and do not pretend to) answer all questions. To use a metaphor to talk about metaphors, metaphors are like the blinkers you put on race horses to make them focus on the track and not be distracted by the spectators. So, for instance, if I describe my love as a rose, I am presumably talking about her freshness and beauty — perhaps I am joking about her being a bit prickly — but I am not talking about her religious affiliation or her mathematical abilities. I am not saying she is not religious or cannot do mathematics, I am just not talking about those sorts of things. So here I do part company with Rosenberg. I think his insensitivity to history blinds him to the fact that science does not ask certain questions and so it is no surprise that it does not give answers — at least, not answers of a form that the theist finds adequate. As I have said, I am not at all sure that the theist’s own answers are correct, but they are not shown incorrect or inappropriate by modern science. Science is limited in scope and since, even if in the future you get rid of the metaphors of today’s science, you will have to find other metaphors to replace them, I would argue that science by its very nature is destined forever to be limited. History shows that! I have tried to make these comments constructive. Obviously in a major way I find Rosenberg’s book intensely irritating. But I want to go beyond that because in some respects — and this applies to other parts of the book I have not really touched — I think his ideas and arguments are insightful and often correct. And where I differ from him, I find his positions stimulate me to provide alternatives that I think are better. So perhaps in the end, like the unfortunate curate, I find myself with an egg that is not entirely wholesome, but probably the good parts outweigh the bad parts. Michael Ruse: "The old science saw the world in an organic mode — things were living in a sense — and that is why, for instance, it was appropriate to ask about final causes and meanings. The new science sees the world in a machine mode — the mechanistic philosophy — and that, among other things, is why it is inappropriate to ask about final causes and meanings and so forth. It seems to me that science is undergoing another paradigm shift (perhaps back to the original organic view). The mechanistic world view is no longer supported by contemporary physics (relativity theory and quantum mechanics). So, it may no longer be inappropriate to ask about "meanings and so forth." Of course, the universe is not literally a machine (which, among other things, implies a designer and/or engineer), but (as far as I can tell) the machine metaphor still dominates the physical sciences (thus Ruse's "new science" reference and the "mechanics" in "quantum mechanics"). In other words (unless perhaps one cherry-picks an unrepresentative sample of physical scientists), I don't expect that one will find much teleological (or teleonomic) thinking and/or language among contemporary scientists these days until one gets somewhere into the life sciences (and even there controversies remain). I agree that the "machine metaphor" still dominates the physical sciences. But the fact remains that the metaphor is no longer appropriate because our prevailing scientific theories (relativity and quantum mechanics) hold that nature is not strictly mechanistic. Fact? Sorry, but that looks more like an opinion - one that (in my experience) is not shared by the majority of experts (including, not only scientists, but also historians & philosophers of science, like Ruse). This not my opinion. It's the standard interpretation of QM...an interpretation that is held by the majority of physicists. "According to this interpretation, the probabilistic nature of quantum mechanics is NOT a temporary feature which will eventually be replaced by a deterministic theory, but instead must be considered a final renunciation of the classical idea of "causality." 1) I'm not sure which metaphor is most apt to describe a probablistic model (a game perhaps? ), so it's by no means obvious to me that we can do any better than a machine metaphor (let alone with a revived organism metaphor). 2) While I agree that the Copenhagen interpretation is indeterministic, there are numerous interepretations of QM and it's no longer obvious which is the most popular among experts. What's more, the only poll of experts that I'm aware of suggests that the (deterministic) many-worlds interpretation has become dominant. Are any of those many worlds indeterminate? I think you're being somewhat disingenuous here. Previously, you implied that Whitehead's "process metaphysics" (a.k.a. the "philosophy of organism") was the most apt one. Are you retracting your previous position? The Copenhagen interpretation has been traditionally the most popular among physicists. And the poll you cited is considered to be controversial. Alastair, help me understand how the debate over whether the universe is deterministic or probabilistic (at a quantum level) has any bearing on questions of meaning. I can't follow your connection there. Sorry to have confused you, but that's a poor excuse for an ad hominem argument like the one you just led with. I stand by the two points in my previous comment. I'll just clarify that (1) a machine is by no means a perfect metaphor for nature (no metaphor is), but an organism metaphor seems even less so; and (2) a controversial poll is the closest thing that we have to statistical data on which QM interpretation is favored by experts nowadays and it just so happens to contradict your (non-expert) opinion on the matter. Lastly, to adequately judge which QM interpretation is the most parsimonious requires a level of domain knowledge (i.e. of all the pertinent facts) that I do not claim to possess (nor, I strongly suspect, do you). That said, while I have no compelling a priori objections to the "consciousness causes the collapse" claim (i.e. I admit that I think it's weird, but then I also recognize that weirdness is a pretty weak objection), my sense is that it's highly controversial among experts, which leads me to doubt that it is, in fact, the most parsimonious interpretation. PS: In case it's not clear, my previous post is in response to Paisley. "In any case, I think the best (or most charitable) interpretation here is that every "thing" (including our selves) is in flux, or that no "thing" is indefinitely stable (particularly our selves), such that the practice of describing fundamental reality in terms of processes is apt - indeed, plausible (which, according to Flanagan, is also "why A.N. Whitehead at the dawn of elementary particle physics endorsed 'process philosophy'")." Whithead himself referred to his philosophy as the "philosophy of organism." The bottom line is that the "many worlds" interpretation is a metaphysical interpretation (not a scientific explanation). So, it really doesn't matter how many physicists believe in it. And since we are doing metaphysics here, then I would argue that "consciousness collapses the wave function" is a far more parsimonious metaphysical explanation. Hitherto, you have provided me with nothing that would lead me to believe otherwise. Paisley: Thanks for taking my comment out of context (from here re: my reflection on the Buddhist concept of impermanence) - not that it contradicts anything I've said in this thread, as far as I can tell. If, as I strongly suspect, your belief that "consciousness collapses the wave function" is driven by a prior religious/philosophical commitment (e.g. to mind-body dualism or idealistic monism), then it a fool's errand (even for someone who is a lot more knowledgeable of physics and the history & philosophy thereof than I am) to attempt to change your mind - especially in a forum like this one. Some say it's the confirmation of anticipation that collapses the wave function, but it's still a guess. Whenever this topic comes up, I think of that famous Richard Feynman quote: "I think I can safely say that nobody understands quantum mechanics." Yet, how often do we run into folks claiming that it supports their worldview? You're simply upset because I called you out on your contradictory stance. Nah, we just disagree that there is a contradiction. For example, I also said in that same previous discussion that "I'm agnostic about such matters" - meaning metaphysics (including the Buddhist kind). But I'll grant you this much: Were I more committed to the Buddhist concepts of impermanence and not-self, I might agree that the machine metaphor for nature (as a whole) is even more imperfect than I stated above, insofar I don't tend to think first and foremost of machines as being "in flux." Instead, I think of fluids - first and foremost, water. That said, while organisms are composed mostly of water, I do not (as far as I can recall) experience organisms as water, but rather as entities distinct from water (presumably because of all the tissue that gives them form). Thus, an organism metaphor for nature (as a whole) does not click for me (nor, apparently, for most physical scientists). "While there is much to be said against a naive conception of a soul that is independent of the brain, the place of consciousness in the natural world is very much an open question. The idea that brains produce consciousness is little more than an article of faith among scientists at present, and there are many reasons to believe that the methods of science will be insufficient to either prove or disprove it." One more reason not to take Harris seriously. "The characters of brain states and of phenomenal states appear too different to be completely reducible to each other. I suspect the relationship is more complex than traditionally envisioned. For now, it is best to keep an open mind on this matter and to concentrate on identifying the correlates of consciousness in the brain." I find Ruse's comments about history and metaphor especially useful, interesting, and on target . . .
"So here I do part company with Rosenberg. I think his insensitivity to history blinds him to the fact that science does not ask certain questions and so it is no surprise that it does not give answers — at least, not answers of a form that the theist finds adequate." But does it make the questions wrong, though? I could imagine a hypothetical philosopher (or in this case, not so hypothetical) saying "I realize that my position is simply not going to be acceptable to a lot of people" to any suggestion that their naturalistic account of morality is inadequate; I don't think that hypothetical philosopher would readily abandon his or her position so easily on that charge. Is the use of the mechanistic metaphor wrong seems the first meaningful question, I would think that Alex Rosenberg would be justified in dismissing such concerns as a non sequitur. RickK: "Alastair, help me understand how the debate over whether the universe is deterministic or probabilistic (at a quantum level) has any bearing on questions of meaning. I can't follow your connection there." It has to do with "final causation" (teleology). RickK, your qualifier "at a quantum level" is critical. Until QM can account for even the chemical properties of water, then I'm not going to give it much time in my life. It seems to make as much sense as looking for your keys with a microscope. "I don’t think it makes much sense to claim that higher level objects do not “really” exist just because their lower level nature is different. Imagine a biologist who said that ecosystems don’t “really” exist because living organisms are actually made up of cells. Yes, they are, but there are emergent properties (*) and interactions that make it impossible to understand ecosystems as a function of cell structure, and any serious ecologist better acknowledge that and get down to work. Similarly, above-fundamental levels objects are not illusions or a metaphysical afterthought, they are just as much part of reality as the mathematical structures inherent in string theory or loop quantum gravity." I don't think it makes much sense to claim that objective phenomena exist independently of all subjectivity. I like this review a lot. An author who is willing to overtly weave himself into his writing seems more trustworthy to me. Accounting for your predilections is much safer than pretending you don't have them. To assert that you possess historical evidence of the limitation of science is to commit the fallacy of the stolen concept. Correctly identified, science implies the application of evidence and logic in order to infer a conclusion. There is no “beyond science” because there is nothing beyond existence, i.e. evidentiary matter. Read “Introduction to Objectivist Epistemology” for more details. Not much, as you can see. And there is no such thing as a "fallacy of the stolen concept" outside of Ayn Rand lingo. Correctly identified, science implies the application of evidence and logic in order to infer a conclusion. When did experimental and empirical science *prove* logic and order and drawing such inferences are a valid proceeding? “the conviction that the methods of science are the only reliable ways to secure knowledge of anything;"
How did *science* study the various methods available and decide SCIENTIFICALLY that the current 'scientific' methods are "the only reliable ways". Upon what criteria did it base that conclusion? ANSWER: Rosenberg is scientifically intelligent, and philosophically (i.e., as basic wisdom about how to think well) an idiot. YOU CAN'T do science without pre-scientific foundations that speak about how to think well, and that pre-scientific foundation CAN'T be provided by scientific proof because it's what provides us with the confidence that things like empirical validation are worthwhile. If you can't trust empirical validation, you can't get around to doing science, and you can't use science to tell you why trusting empirical validation is worthwhile. What's worse is people reading Rosenberg, who ADMITS this self-oxymoronic aspect of his thesis, and still take his thesis seriously. Thanks for the historical overview, always good to learn things as I tend to confine myself to facts from the encyclopedia and my own trust in logic, rather than identities. What a wonderful history it is, with fine characters, and some villains. My four modern pillars and paradigms are Newton (the absolute view in physics, from the absolute void, with preferences open for cosmological systems under God); Kant (the relative view in biology, from the entity itself confined to that perspective ); Darwin (the absolute view in biology, from reproduction, with preferences open to adaptation under Nature); and Einstein (the relative view in physics, from the mass itself confined to that perspective). It is interesting and perhaps understandable if you understand history that the Englishmen come from a nation open to invasion over centuries and requiring practicality, thus practical but limited discoverers taking the absolute view. The Germans are from an enclosed claustrophobic hub from which a relative view has often emanated. It is also interesting that the distinction between absolute and relative is total, iron clad, in the case of these four identities. They might even be THE fundamental divisions of existence. Let me propose that history, also, provides a means of slicing up the essentials of existence if we know how to read it and the identities involved. PS. Three of them are very much alive, and Newton's ideas are dead, but I hypothesize that Newton can be reconciled with Einstein. The putative expanding Spacetime, which is a 3-D + Time arrangement of its own internal unified composition, can exist in a void of 3-D + Time offering no measurable resistance. Interestingly, this neat coexistence exactly matches the coexistence of Darwin and Kant in my hypothesis. PPS. You might think; who cares if there is or is not a void around it all, its just a void. It is crucial for a sensible understanding of the universe. Apart from avoiding the problem of "nothing" into which our universe is expanding, you will realize that Einstein's is a completely enclosed universe and Spacetime is continuous. Any view from within it is a relative view, and logically there can only be views from points within it. Without a void from which to see the mechanical interface of gravitation causing the perspectives, from the outside as it were (or even the Whole Shebang as plotted 3-D coordinates over time instead of the expanding rubber surface we are dished up by modelers of Gen Relativity) we are deprived of those interfaces and must accept the continuity of relativity. Modelling in any time or space frame within a void of 3-D + Times provides a setting for sensible analysis (even though in reality all measurements are relative to the observer).